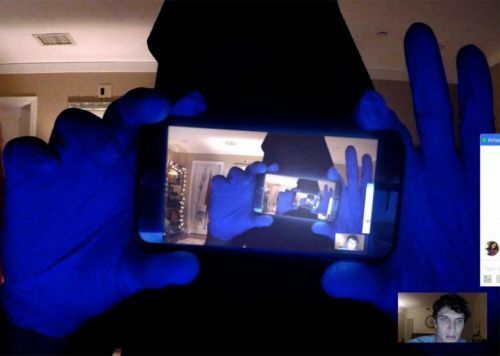 Making his feature directorial debut, “The Grudge” writer Stephen Susco scares up a handful of unnerving images and grim thoughts in “Unfriended: Dark Web,” a standalone follow-up to the incredibly profitable 2014 Blumhouse film. Like the first “Unfriended,” “Dark Web” was produced at a cost of roughly one million dollars, practically guaranteeing a big return on investment by the conclusion of its opening weekend. The second installment retains the visual gimmick of delivering the entire story through a series of websites, login pages, applications, video chats, windows, text messages, folders, drop-down menus, and other familiar computer screen experiences that members of the target demographic will instantly recognize. As a relatively new subset, or extension, of the found footage technique that has existed for a long time, the computer screen point-of-view, or screencast, borrows key tropes from established, hallmark films. Susco mixes in everything from first person camera perspectives ala Robert Montgomery’s 1947 “Lady in the Lake” to the tight close-ups of distressed, sobbing, and almost always doomed unfortunates that call to mind Heather Donahue in “The Blair Witch Project.” One of the first movies to successfully deliver the screen-exclusive storytelling device was Walter Woodman and Patrick Cederberg’s 2013 short “Noah,” and while a few aspects of the approach have evolved these past five years, the basic gist in “Dark Web” is the same. “Dark Web” skips the supernatural dimension of the previous “Unfriended” for malevolence grounded in conspiracy theories growing out of the shadowy and unindexed destinations of the World Wide Web that conjure longstanding nightmares of the worst kind of criminal acts, including kidnapping, theft, and murder. Susco combines several of these scenarios via the journey of Matias (Colin Woodell), a tech-savvy guy who has apparently acquired a used laptop that still contains all kinds of sensitive files. Matias, desperate to win back the love of Amaya (Stephanie Nogueras), also participates in a regular game night group video chat with a circle of their close friends. Needless to say, the previous owner of Matias’ computer is a very bad person, and following the exposition/set-up, Susco shifts toward a variation on “The Old Dark House”/“And Then There Were None” approach to supporting characters. While the body count increases, Susco plays with a few interpretations of cat-and-mouse, although the balance of power never really swings in favor of Matias and his pals. In one scene, a character suffers the horror of swatting, and while the details are farfetched in Susco’s dramatization, echoes of the 2017 death of Andrew Finch in Wichita, Kansas raise questions about the filmmakers’ willingness to caricature unsavory realities of genuine harassment. April Wolfe even argues that the movie “inadvertently glorifies hacker chaos trolls and criminals as hyper-intelligent masterminds,” and her point is worth contemplating, although she goes on to acknowledge the conundrum of critiquing the horror genre on the basis of morality. One would think that at least some of the contemporary specifics of the screencast approach to narrative filmmaking come with the inevitability of rapid obsolescence as social media platforms, and the way in which we use them, change and morph. Will these films be viewed one day as curiosities, time capsules, or something else? No matter what happens to the style, there is surely an aspect of movies like “Unfriended: Dark Web” that inspire critical viewers to wonder about the amount of time that so many of us already spend each day looking at a monitor.